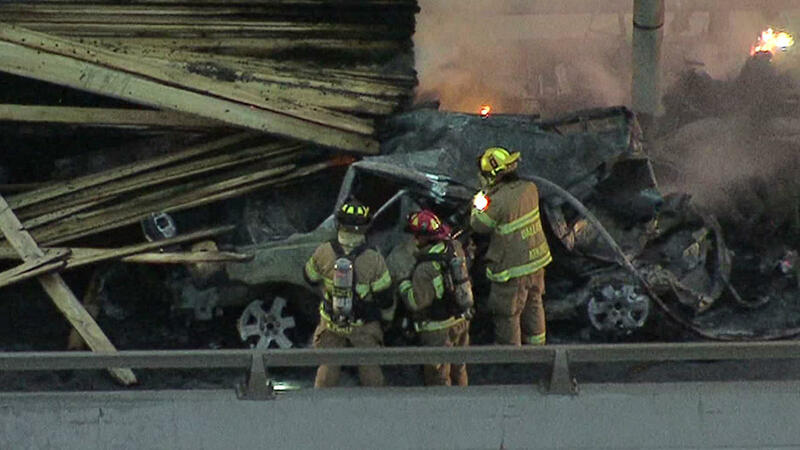 A fiery incident involving a semi-truck on the I-20 overpass left two adults, three children dead in this October 2015 file photo. The driver of the 18 wheeler survived. DUNCANVILLE—The Duncanville City Council is staying firm when it comes to keeping the roadways safe in the city. They passed a resolution meant to oppose any legislation that will increase the transport haul weights over city roadways. According to Public Works Director Michael Hasler, the Coalition Against Bigger Trucks made a plea to the City of Duncanville. In advance of the upcoming legislative session, the coalition asked the city to provide a resolution opposing bigger trucks. The last time Congress increased the federal weight limits for large trucks was 1982. Another increase up to 97,000 pounds is now likely to be considered. In the past, the idea was that bigger trucks would result in fewer trucks on the roadways. According to statistics this has not been the case. Studies show that the number and mileage of trucks traveling in the United States has steadily increased since the passing of the 80,000-pound weight limit. A study conducted in 2010 concluded that an increase from the current weight to the proposed 97,000-pound weight limit could reduce overall rail traffic by 19 percent. However, this same study found that diverted freight would inevitably find its way onto the highway, resulting in eight million more trucks on city roads and bridges, which is a 56 percent increase. Last year there was a bill introduced in the Texas Legislature that would propose an increase in the maximum allowable weight to 97,000 pounds. Congress then voted to reject both heavier and longer trucks. Now, lobbyists in Austin are urging Texas lawmakers to allow heavier trucks on state and local roads. Since Congress has already rejected heavier trucks on the interstate system this would force the heaviest trucks to operate on state and county roads instead. Duncanville Police Chief Robert Brown has written several State Representatives and Senators to oppose legislation that would increase truck weights in Texas. In limited testing for a report to Congress in 2016 the U.S. Department of Transportation found heavier trucks have a 47 to 400 percent higher crash rate. Heavier trucks also have a higher risk of rollovers and triple-trailers are more likely to experience trailer sway. In addition to the safety concerns the increased weight would also be a problem on city roadways. The increased truck traffic and additional weight placed on Duncanville’s roadways could potentially add billions of dollars in repair costs.